To an outside observer, hoarding may seem like a simple problem. The person affected has let too much clutter build up in the home which means it is time to do some cleaning. However, hoarding is much more complicated. Those who hoard have a mental disorder with a high level of anxiety that prevents them from throwing anything away. The clutter from hoarding can grow to dangerous levels and make the home unsafe or unsanitary, which is why it is important to approach a hoarder about cleaning the home. At ServiceMaster by Disaster Associates, Inc., we can help those affected by hoarding in Peabody, MA clean and restore their homes with our hoarding cleaning services. Our technicians can provide effective cleaning services in the most extreme situations, and we take a respectful approach and include the affected individual in the process. If you have a friend or family member in Peabody, MA who struggles with hoarding, it is important for you to try and reach out to them for help because hoarders rarely seek help on their own. A person whom the hoarder trusts should attempt to intervene by helping the individual understand that there is no need for them to feel embarrassed, but that it is urgent for their own safety to clean the home. Once the hoarder agrees to move forward with the cleaning, you can contact ServiceMaster by Disaster Associates, Inc. for professional assistance. Our technicians can help create a cleaning plan and thoroughly clean and disinfect the home using advanced equipment and cleaning products. Valuable items like money, jewelry, and other keepsakes are saved. Unwanted items are recycled, donated, or thrown away. We help decide what to do with each item while leaving the final decision to the affected individual. We will donate unwanted items or take them to friends and family members. We will assist with necessary paperwork from attorneys, trusts, and government agencies. We try to assess the extent of the situation without entering the home. We build a personal relationship with the affected individual to earn their trust and respect before proceeding. If the individual agrees to proceed with the cleaning, we will help form a cleaning plan with the individual and their family, and we may also involve a counseling professional. We will form the cleaning plan with the help of the individual and their family to remove unwanted clutter from the home. Once the unwanted items are removed, we will help clean and reorganize the home. We can help the affected individual make the final decisions regarding whether to throw away, recycle, or donate their unwanted items, while leaving them with the final decision. 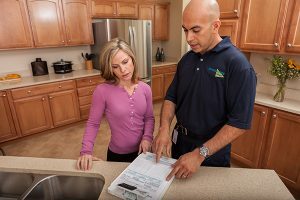 After the home is cleaned, we will help form a plan for the individual to keep the home clean. We will follow up over the phone to check the progress of the maintenance plan. Our technicians will come back to the house for further services if necessary. When homes become too cluttered from hoarding, there is an increased risk of fire, injuries, and mold or bacteria growth that can make those in the home sick. It is very important to approach someone you know with a hoarding problem, but do it in a respectful manner and let the individual decide whether to go through with the cleaning. ServiceMaster by Disaster Associates, Inc. is ready to help those in Peabody, MA that are ready to clean out their homes with our hoarding cleaning services. You can call us at (781) 350-5510 for more information about these services.